Gross Weight (GVWR) 9895 lbs. 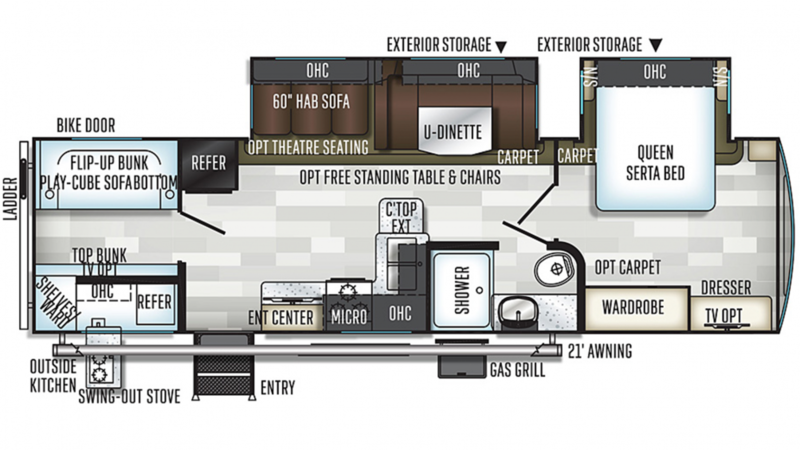 Camp like never before with the 2019 Forest River Flagstaff Super Lite 29BHS Travel Trailer! Gillettes Interstate RV offers low prices and affordable financing for all of our RVs. If you're looking for an East Lansing RV dealer, look no further and stop by 7210 E Saginaw St East Lansing Michigan 48823! If you would like to talk to one of our RV experts today, call us at 517-339-8271. Traveling the road is a breeze with this Travel Trailer! It has a very manageable hitch weight of 1095 lbs, is 35' 2" long, and 8' 0" wide! The GVWR of 9895 lbs. means this rig is built for the road! When you reach the campsite, the 21' 0" patio awning will provide shade and protection for outdoor relaxing! The spacious Forest River Flagstaff Super Lite 29BHS not only has plenty of living space for the daytime, but it also has plenty of sleeping space, too! Up to 9 people can sleep inside! Especially nice is the master bedroom with its comfy Queen bed! You'll drift off to dreamland every night, cozy and secure! Whether you enjoy a nice hot shower in the morning or a refreshing hot shower at the end of the day, you'll have no worries thanks to the big 60 gallon freshwater tank and the 60 lbs. of LP tank capacity! The convenient Foot Flush toilet means no trips to the often messy, cold campground community bathroom! Used water and waste are stored and hidden in the 45 gallon gray water tank and the 90 gallon black water tank. Treat your children to a full night of comfy sleeping! They'll drift off to sleep with ease in the comfy Bunkbeds in the bunkhouse! Don't miss the fun and sun outside to cook meals inside! Whip up your breakfast, lunch, and dinner out in the fresh air with the outdoor kitchen!